No doubt, the loss of a Democratic Senator is not the kind of present President Obama wanted for his one-year anniversary. He would have preferred passage of his long-promised goal of health-care reform over this stunning defeat that puts any reform in jeopardy. Now that Republicans have gained filibuster power, can the Democrats still pull this one off? My colleague, Joe Lazzaro, thinks they might do it just yet. Investors, however, seem to have already started to bet against health-care reform. Already on Tuesday, the health-care and pharma sectors climbed higher, a trend that mostly continued on Wednesday.Are investors being short-sighted, missing the long-term potential of the bill? The reform will likely hurt revenue for many companies in the health-care sector initially. But over the long-term, it may actually increase revenue as millions of Americans currently not covered gain health coverage. Sanofi-Aventis's (SNY) CEO said so clearly a few months back. The market, though, is concentrating on the higher fees, increased regulation and narrower profit margins -- the result of the government cutting costs to achieve the increased health coverage. This, most believe, would lead to an overall net loss at companies as a result of the health-care reform, or a net gain from the bill's demise. So as Wall Street anticipated, Republican Scott Brown won the open U.S. Senate seat in Massachusetts. The seat was once held by Democrat Ted Kennedy. Pharmaceuticals, health-care companies and insurers were among the best performers Tuesday. Humana (HUM) jumped 7.1%, and Merck (MRK) climbed 2.9% to lead gains in the Dow Industrials. On Wednesday, Humana fell amid a general market downturn but Merck was up more than 1%. After the election was over, solidifying an outcome that would greatly reduce the odds that health care reform, drugmakers also rose in Asia and Europe. London-based GlaxoSmithKline (GSK) and Paris-based Sanofi-Aventis (SNY) rose in their respective markets but fell in the U.S.
Will gains continue? Well, the trading session opened in the U.S. Wednesday with markets selling off over 1.5%. The health care sector in general is down, but perhaps not as much. Beyond Wednesday, however, the positive trend is expected to continue. For example, medical device makers, which already rallied Tuesday, may see more gains going forward. 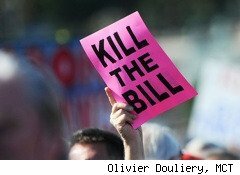 Michael Weinstein, an analyst at JPMorgan Chase said they stand to gain if health-care legislation in Congress fails. He thinks small cap companies stand to gain most from the bill's collapse, including such companies as Volcano (VOLC), Wright Medical Group (WMGI) and NuVasive (NUVA). TheStreet.com's Don Dion adds Medtronic (MDT), Thermo Fisher Scientific (TMO) and Stryker (SYK) to the list, although he prefers medical devices ETFs such as The iShares Dow Jones US Medical Devices ETF (IHI), iShares Dow Jones US Pharmaceuticals ETF (IHE) and iShares Dow Jones US Healthcare Providers ETF (IHF), which all fell significantly in 2008 due to the looming reform and have been rebounding since. Other sectors that stand to benefit from the bill's failure include insurers with the largest exposure to Medicare Advantage, such as Humana and Coventry (CVH), according to Monness Crespi Hardt health care analyst Avik Roy. And lest we forget, there is the insurance group, including Aetna (AET), Cigna (CI) and WellPoint (WLP), which finished mixed on Wednesday. As for pharmaceuticals, Eric Lo, an analyst at Bank of America/Merrill Lynch says they've already outperformed in the past quarter, but still some companies that have high exposure to government-related drug spending could stand to gain more from the bill's failure. These include Eli Lilly (LLY) and Bristol-Myers Squibb (BMY). Similarly, Big-cap biotech stocks like Amgen (AMGN), Celgene (CELG), Biogen Idec (BIIB) and Genzyme (GENZ) can see a clearer path now that the threat to shorten their patent exclusivity term is greatly reduced.